This is a hot time for World War I and World War II mysteries set in Europe, especially England and France -- and Italy, come to think of it. And there are also some series set between the wars. It's a great time to probe the complications of two terrible conflicts, through crime fiction. But what about on the home front? Yes, the U S of A, where in the 1940s there was rationing of gasoline and tires, changes of car manufacturing lines to build tanks instead, and a certain patriotism in women pretending they wore stockings, while actually giving them up, for the war effort. By zeroing in on this era in Detroit, the Motor City (yes, that's where Motown came from, too), prolific author Loren D. Estleman takes a walk on the dark side -- because this was a period of stunningly brutal policing, where the criminal enterprises and the cops stayed connected, and brass knuckles were as much a tool of law enforcement as they were of crime and bar fights. Estleman's Amos Walker series (1980-2014 and continuing) is set here; so is his "Detroit series" (published from 1990 to 1999), which sets out to tell a significant part of the American story through the history of crime, gently fictionalized, in a quintessential American city. In addition to his novels, though, Estleman has steadily provided short stories set in Detroit, especially for Alfred Hitchcock's Mystery Magazine, edited by Linda Landrigan. For his new release from Tyrus Books, DETROIT IS OUR BEAT, Estleman rounds up nine of these tales of his "Racket Squad" -- a plainclothes detective squad of four, showing what it means to be tough on crime under wartime conditions (not enough men, not enough gasoline, and so on). Lieutenant Zagreb, Sergeant Canal, and Officers McReary and Burke are loyal to each other and to getting the job done. But don't count on rules being followed in the process. The bodyguard tried to roll with the blow and reached under the sagging side of his coat. McReary, stationed on that side, slid the blackjack out of his sleeve and flicked it at the back of the man's hand as it emerged. The big semiautomatic pistol thumped to the carpet. Burke kicked it away. "Just like Busby Berkeley," Zagren said. "Show some manners. Knock on the door." The bodyguard, bleeding from the temple, ungripped his injured hand and complied. Right, so this isn't sweet stuff (and it's from those classic years, too) ... but there's plenty of squad loyalty, lots of dark humor, and a heaping helping of city police life from the wild days of wartime. So if you'd like to round out your "wartime" crime fiction reading, grab a copy of DETROIT IS OUR BEAT. Hard to tell what the release dates are for the various versions of the book (hardcover and paperback are both listed for May 2 at one online site, but Tyrus released at least one version last October). But if you like American noir with a lot of style from the glory days of the gangsters, tuck this one into your beach bag or briefcase and, as Estleman suggests, "It's the 1940s, gate. Don't be a moldy fig. Get hep, jump to the jive, ring your favorite Jane up on the Ameche, and don't spare the horses." Maryland author Stephen Kelly, swooping into a new career after some 30 years as a journalist, gives us a debut crime novel of intricacy and depth. Detective Chief Inspector Thomas Lamb, struggling with small wartime deprivations of coffee, jam, and eggs in the rural Hampshire area of England in 1940, is well aware that he's fortunate to be too old -- and too "essentially employed" -- for the armed forces. Lamb shields his wife Marjorie as much as possible from the daily horrors of his job. So when he's called to investigate the murder of Will Blackstone in the nearby village of Quimby, and learns the victim was rumored to be a witch, he merely tells his wife he has to go out because someone has killed an old man. To her question on what's happened, he summarizes quietly: "The usual thing, I'm afraid," he said. "He probably quarreled with somebody." But Blackstone's death is only the first of a stunning sequence around the village, all somehow related: by method, and sometimes by small drawings contributed by a young local man whose skill in art is equaled by his silence and shyness, perhaps due to something like autism spectrum disorder. And the wartime stresses, the constant stream of able men into the army and navy, has left Lamb short of investigative manpower. Still, the last thing he expects or wants is the arrival of DI Harry Rivers to assist. Rivers, it turns out, has an enduring resentment toward Lamb, left over from their service together in the preceding war. It's a dark, bitter anger that's likely to poison the work they'll have to do together. 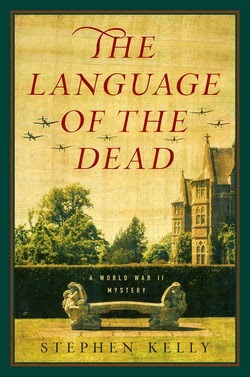 Early reviews compared THE LANGUAGE OF THE DEAD to Charles Todd's books, but a better match (across gender but accurate to the themes) would be to those of Jacqueline Winspear. Lamb isn't mentally out of adjustment in any sense, but rather is both kind and direct, with a drive to do his work well and lead his team adeptly. He has none of the deep psychic wounds of Todd's Scotland Yard detective Ian Rutledge. Even his earlier war service -- although his new team member won't admit it -- was straightforward, necessary, and courageous. He has nothing to be ashamed of, unless it's his own shock at how terrible the world can be. Even his newly grown daughter Vera seems less naive at times than he is, which Lamb himself realizes. The setting is rich with farms, traditions, and folklore. But the darkness propelling the sequence of deaths, as Lamb probes the crimes, gradually comes into focus, and with it, so does the level of risk to Lamb and his associates (even his family). If there's any sign of "first book" here, it could be the way the tangles of the plot call for Lamb himself to explain the twists to his men near the end of the book. But an astute reader will have followed his reasoning and be most of the way to the investigation's solution and the book's resolution. A highly satisfying conclusion wraps up THE LANGUAGE OF THE DEAD, and there's good reason to hope that Pegasus Crime will follow up with a sequel from Stephen Kelly. Since this one's a debut, collectors will want to catch a copy in first printing -- take action now, as the book was released on April 15. At the other pole, much more darkly, are two series from today's grand master of Australian mystery, Garry Disher. His Wyatt books work from inspiration in the Richard Stark (Donald Westlake) character of Parker and endow Wyatt himself with more bitterness, fewer emotions, and a single vulnerability -- and a career as a jewel thief, loner, and sociopath. In extreme contract, Disher's other series, featuring Hugh Challis and Ellen Destry, fingers the social fabric of Australia's Mornington Peninsula, southeast of Melbourne, through the emotional tension of being police investigators who fall into a complex love affair that becomes serious and committed -- and a challenge for two workaholics. Now add a third significant author to the Australia crime fiction shelf: Alan Carter. Born in 1959 in the United Kingdom, Carter emigrated to Australia in 1991 and worked as a TV documentary director. 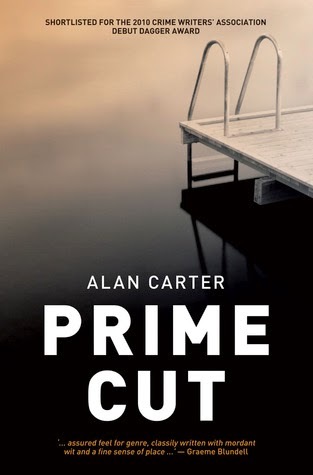 With 2011 publication of his first crime novel, GETTING WARMER, Carter shot onto the award lists, and his second in the Cato Kwong series is PRIME CUT. Both were released in the United States in 2014; the third book is due this year (Bad Seed) but seems to have hung up in the publication process, as it's now past due. And what a series. Detective Senior Constable Philip Kwong -- nicknamed Cato, a dig at his Chinese heritage (after the Chinese character in The Pink Panther) -- has sunk so low in the opinion of the police administration that his assignment at the opening of PRIME CUT is to the Stock Squad: the team that investigates dead cows among the ranches. It's dull and demanding at the same time, and it's utterly humiliating. So when Cato has a chance to fill in on a real investigation, he's quickly engaged in the only part of a mining-town crisis that nobody else seems to care about: the discovery on the shore of a headless, armless, legless human torso that nonetheless suggests Asian origin. Even though he's clearly destined to be shipped back to his tedious assignments, Cato clings to the case day by day, and finds motive, means, and opportunity among the hardscrabble workers and bosses at the booming and brutal mining operation. When he starts to pry into the Chinese workers and their situation, he sets off a cascade of further brutality. Cato's a complex investigator, hungry for his work and career but caught up in both the social stratification that pushes Asians downward, and his own mistakes in rushing both evidence and accusations. Half the pleasure of reading PRIME CUT is seeing him fall, rise, fall, and possibly move forward. "Wellard seems to think he's in charge." "You and him go back a long way. Aren't you meant to be the one in charge?" Cato's suspicion of his fellow officer turns out to be well founded. But it's all more complicated than that, and soon the summer fires will make it worse. These books slide along the line of gritty and grim, but with plenty of emotion -- Cato may sometimes wish he doesn't feel pain or loss, but the truth is, he's involved as both an investigator and a dad. 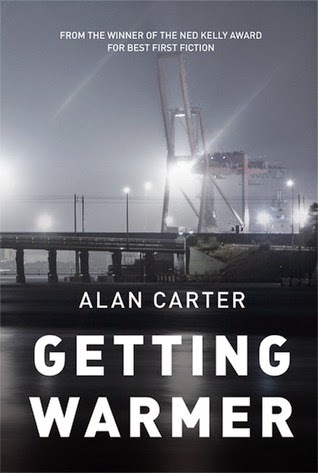 His struggles against department politics and pervasive racism add to the tension and interest, and author Alan Carter spins a taut, engaging plot that's so closely bound to the landscape, you can almost feel the grit in your teeth in some of the chapters. No extraordinary gruesomeness, but a steady surge of urban violence here -- and a very masculine world of crime-fighting and challenge. I enjoyed both books (although I needed to get outside and walk afterward, to reassure myself that I live in an easier, calmer place). It's good to know the third one, Bad Seed, is on its way from Down Under to the American market sometime this year. One day, Hiltunen, who admits he is often called the Finnish Stieg Larsson (both authors had been journalists), met a pair of very intelligent women who were highly knowledgeable about crime-fighting, and the experience began to possess him, turning him toward careful observations of the power of women's friendships. When he pulled a plot into place around the characters who were coming alive to him -- Mari and Lia, two Finnish women in London with vastly different roles in a private crime-fighting force called the Studio -- he found he'd become fascinated as much by the friendships as by the crimes. Although Mari and Lia are "on the same side" and investigating and taking action together, they haven't revealed themselves fully to each other. This added level of mystery ramps up the tension as they tackle a new form of terrorism. The crimes begin with what seems like a prank: People's YouTube accounts are being hacked, and under their names, bizarre all-black videos of just darkness air on the social network. But then videos of brutal violence appear in the same way -- on accounts of people who are clueless about why they've been targeted -- and the body count in London soars. It's clear there's a hate-crime aspect to the choice of victims ... and when Mari's team tries to tackle solving the crime in ways that the conventional police either can't or won't, one of the team members becomes another victim. Hiltunen forsakes the "easy crime" paths, opening up instead the layers of soul-crippling grief that come with the loss of a team member, and the desperation that takes over in the ensuing weeks, even months. What pulls the team back together is an odd but very realistic mix of family support, personal determination, and unwillingness to see the investigation fail -- especially when it means that a murderer who's damaged the team directly may escape. Don't take the Stieg Larsson comparison to heart: Hiltunen's direction, although it involves brutal crime, avoids (at least in BLACK NOISE) the sexual predation that stalks Larsson's books, and the violence, while horrible, skates a fine edge of being "real" but not obscenely gory. It's the characters that matter -- their delicate approach to each other's private worlds, and their willingness to go beyond friendship, in the way that elite armed forces members forge a bond that carried them into action despite the terrible costs ahead. This isn't just a psychological thriller; it's a probing and rewarding look at how people choose to assert the demand for justice. Mari changed her mind about standing aside once the police spokespeople announced that the kickings weren't necessarily hate crimes. The determination and speed with which she took up the case showed how angry she was. Immediately after the updated police press conference, Mari called them all to the Studio, and as she walked to Bankside, Lia already knew what was up. 'Idiots,' Mari said, meaning the police. ... 'They were all grabbed coming out of gay bars,' Mari said. 'And their bodies were brought back to the bars." ... Mari already had tasks outlined for them. 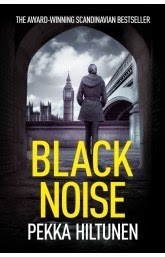 Not only did I savor BLACK NOISE -- I'm sure I'll be re-reading it. And, oh yes, I'll have to find a copy of the first in the series, Cold Courage. There's a video of the author describing his entry into that first book, on YouTube (shiver!). Click here to watch it, provided by the publisher, Hesperus. Yes, Hiltunen's spoke English is excellent in the video -- but a tip of the hat is due to the translator from BLACK NOISE from the original Finnish, Owen F. Witesman. The book in English flows well, and is well worth reading. 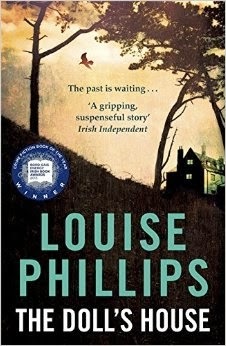 Louise Phillips is a best-selling author in Ireland; it may take a while, in the current flood of imported crime fiction, for American readers to catch up with her. After her dark and complex debut with Red Ribbons, Hachette Ireland now offers her second book, THE DOLL'S HOUSE, to the U.S. market, in softcover. Forget any notion of Ibsen or other dollhouse images -- in this case, a young woman, Clodagh Hamilton -- that's her maiden name, but it's the important one -- is struggling to hold onto her newly gained sobriety, while her husband batters her both emotionally and physically, and her desperate search for sanity forces her to investigate the long-ago family issues around the death of her father, Adrian Hamilton. Accident, or something more sinister? And why did her mother stop loving her, when she was just seven years old? When Clodagh enlists a hypnotherapist to help part the clouds of the past, her frightening gains of memory turn her into a target for the forces of the past. As the plot lines tangle, it's clear that the only chance there is for Clodagh's survival will depend on criminal psychologist Dr Kate Pearson catching up with related deaths and motives, in time to reach the truth. And the doll's house? That's the one from Clodagh's childhood -- the one where, each time she regresses to the past, the dolls take on personalities and sharp voices that warn and threaten. Sure, the voices are those of her own past ... but which ones can she trust, and which are childhood misunderstandings or malicious misleading? The pace is tight, the emotions piercing, and the connections between Clodagh and Kate -- whom we've met in Red Ribbons and whose own life is rapidly fracturing around the end of a relationship -- turn out to be both significant and suspenseful. The clock is ticking, and there's reason to believe that destruction and abuse are multiplying. No, there's nothing particularly "Irish" to this crime novel -- it's built on clearly inked characters, not on the history or traditions of the Emerald Isle -- yet the chilling criminal maneuvers subtly echo the evil that, say, Stuart Neville taps into so readily. Everything here depends on Clodagh and Kate. Struggling with them through the action, readers know exactly how vulnerable each one is. Does the perpetrator know this, also? 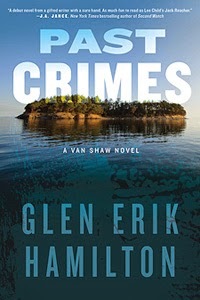 Reading another author's Facebook musings last month, I noticed her enthusiasm about a debut mystery from Seattle native (and now California resident) Glen Erik Hamilton. So I picked up a copy, and soon was in "can't put it down" mode. As many reviewers have noted, this is a very polished "first novel" -- no signs at all of being a debut. So I've got to wonder what Hamilton has already written, and where it's been published. But Hamilton hasn't revealed that, in the dozen interviews of him that I've scanned. In fact, the only hint on his writing career is one comment that "moving away from Seattle" made him want to write about the city where he'd grown up. He also admitted to one interviewer that he hadn't actually started out with "I'm going to write a mystery" -- his adventure featuring Army Ranger Van Shaw, who's been in both Iraq and Afghanistan with the elite fighting corps, started with the relationship of Van and his grandfather, Dono (for Donovan; an Irish immigrant). Dono raised Van and trained him, when the boy showed an aptitude for it, in the trade of immaculately planned robberies, midsize to almost large. The kind that are worth doing, but never with a serious risk of being caught, because Dono is such a detailed planner and so careful to note his surroundings. At first, it's not clear why Van left home -- just that when Dono sends the equivalent (for anyone else's life) of a shout for help ("Come home, if you can"), Van didn't hesitate to apply for leave and race across the globe. His arrival is literally minutes too late to find out what's wrong. There's been a vicious attack on his grandfather, and the attacker is racing away as Van finds himself pinned to his desperately wounded relative, needing to staunch the bleeding and call for help. Soon he's telling his story to police detectives. And it's a sure thing that he'll be a suspect in spite of all this: His grandfather's shady record emerges right away, and Van's in the hot seat. What Dr. Singh had asked me earlier that day came flooding back. Did my grandfather have a living will? Christ, was that why Dono had called Ganz? Had he known that trouble was coming? My fingers gripped the phone, as if testing the limit of strength in my healed arm. Tomorrow was Monday. Ganz's office would be open. Or I could find Hollis. Addy Proctor had summed it up for me: You have to do something. Or go nuts. I was halfway to crazy already. It was time to start pushing in the other direction. As always, what makes a well-plotted crime novel unforgettable is the intensity of the protagonist. Van Shaw's uneasy position, halfway between "trained young thief" and much-appreciated Army Ranger, perched on the edge of a wild land of his grandfather's secrets, turns him into an unlikely and uncomfortable sleuth, one who may decide that balancing the scales of justice is best done personally, rather than through the law. One more good part about this book: The cover says "A Van Shaw Novel." That's a sure sign there's another one already in the pipeline. And in fact, a quick visit to the author's website (click here) gets you to his blog, which reveals the manuscript for number 2 is already headed to the publisher. Way to go! I'm a loyal fan of Jon Land's Caitlin Strong series, in which the descendant of a close-knit family of Texas Rangers shows the guys she can live up to the legend and the skills demanded in modern-day law enforcement, while Land simultaneously reveals details of the long-ago Rangers, as far back as the frontier skirmishes along the Texas/Mexico border. There's a hint of the paranormal in the series, as one of Caitlin Strong's most important defenders has an eerie sense of when she needs him. 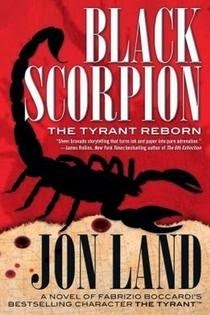 BLACK SCORPION is the sequel to The Seven Sins and provides a fast-paced, intent, multi-point-of-view thrill ride that starts with a powerful symbolic item that belongs to Solomon, son of the great King David, in northern Israel more than three thousand years ago. Then the narrative races among various times and locations, gradually revealing a pattern of competition for that power, among Jewish descendants and those who want them crushed -- yes, even a Nazi element here. But there's Julius Caesar as well, and a fascinating strand invoking the Gypsies of northern Europe, too. Can you resist Romania? Transylvania?? Tying it all together is Michael Tiranno, who five years earlier saved the entire city of Las Vegas from a terrorist attack and now owns the palatial Seven Sins resort there. His expansion plans suddenly suffer attack from a group with ties to European terrorists, the Black Scorpion forces. And the archaeologist who has become his beloved, Scarlett Swan, falls into the hands of those enemies. Michael's efforts to gain her freedom require painful alliances, violent action, and incisive decision making. I won't add more, since this is probably enough for most readers to recognize the type of international and multiple-timeline thriller Land provides in this series (which by the way is headed for both Hollywood and DC Comics plus graphic novels). But I should probably add a "warning label": If you devour Land's new "Tyrant Reborn" thriller, you may become an addict to the series! For the third time, I picked up a Liz Mugavero mystery, I chuckled at the entertaining cover (the protagonist has an organic pet food business) and I kidded myself that the book would be as fluffy as the cute pets on the front. 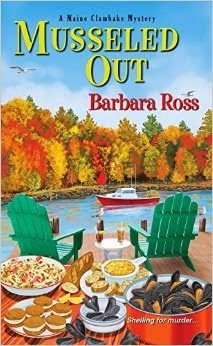 But just like in Mugavero's debut mystery, Kneading to Die, and her second, A Biscuit, A Casket, THE ICING ON THE CORPSE provides a crime adventure featuring amateur sleuth "Stan" (for Kristan) Connor and her Pawsitively Organic pet-focused business in small-town Frog Ledge, Connecticut. And the plot complexities spin, the character nuances are well worth thinking about (Stan's inability to quite commit to her boyfriend; her unresolved issues with her mom), and the insight into (slightly exaggerated, sure) small-town New England life gives me shivers. Oh yes, and a need to set aside distractions and just keep turning the pages! This time, Stan may feel that the costumed townsfolk saluting Groundhog Day -- wearing costumes, outdoors, on February 2 -- have turned the town hall and its environs into something surreal. But she's honored to be involved in the town's noted annual event, presenting an "edible gift" to the visiting creature imported for the occasion. It's a mark of how much people appreciate her pet treats business, and she's got enough orders to keep her running. She'd been getting requests for parties on and off since her first one last October, a birthday party for Benny, the fox terrier, had been so well received. Stan opened a new document on her iPad and prepared to take notes. It would be something else to add to her repertoire -- doggie wedding cakes. I enjoyed the way Mugavero set Stan up to probe the town's history while juggling her work and helping out friends; there are just the right number of red herrings, and the action is swift and believable. If I had Stan Connor living in my town, you bet I'd call her in, as soon as something suspicious cropped up. Or before that, for amazing organic meals and treats for my pets -- oops, maybe not for the guppy in the fishtank, but if I did have dogs or cats ... well, you know what I mean. Mugavero's character line-up of critters is delightful and just as believable as her sleuth. And yes, the book includes some tasty recipes for four-pawed companions. THE ICING ON THE CORPSE was released yesterday, so it should be easy to find a copy -- and if you have the chance, pick up Kneading to Die and A Biscuit, A Casket as well. You don't need to read them in sequence, but why not enjoy the opportunity? Nice chunky paperbacks, from Kensington Books. For more on the author, check out her website, here. even leaning against walls and columns to absorb the conversation. And conversation indeed it was, as the Smith College professor and director of the Poetry Conference at The Frost Place (in Franconia, NH) opened his life, his writing process, and the translated poetry that he and his spouse Stephen D. Miller continue to bring forth from the Japanese. Students and teachers asked questions that led deep into both writing and love of narrative, which this highly accessible poet shared generously. One particular phrase that will stay with me, I know, was Donnelly's comment about the presence of opposing reactions within a single poem: "I tell my students," he said with a smile, "that ambivalence is the mother of poetry." Looking for a signed book by this poet? We have one (click here; when it's gone, it's gone), or reward yourself by traveling to one of his readings or lectures and picking up the one that calls to you most vividly. It's not quite lilac blossom time here, but we salute April as the month of spring anyway, with a major sale for all our books (they are ALL listed on ABE, already discounted by 35% from their usual prices -- click here to search them). We have signed mysteries in lovely condition ... unsigned classic mysteries at bargain prices ... still some poetry and literature and a bit of fine press work ... Browse the listings, or ask us about something in particular (kingdombks@gmail.com).